Justin Bieber rose quickly from YouTube to world wide fame due to the strength of his talent and accelerating media. Others are sure to follow faster and faster. Two years ago almost no one knew who he was, now he’s had an ongoing run of Top 40 hits, a platinum album, and a throng of adoring teenage fans. Justin Bieber is the 16 year old poster-child for the modern version of a meteoric rise to fame. He was discovered from his videos on YouTube, and his managers helped him build a rabid radio, internet, and video following. His first album went on sale in November 2009 and went platinum just two months later. By Christmas, he was singing for the Obamas at the White House on national television. The thing is, Bieber’s story may be remarkable now, but it won’t be for long. Besides his considerable talent, the pop star was the beneficiary of some powerful trends: the viral nature of YouTube videos, the ability for memes to spread rapidly through social networking, and the self-referencing and amplifying attention of the major media. We’ve seen rises to fame before but the speed at which they happen are accelerating. The forces that turn an unknown into a celebrity have strengthened in the past decade, and will continue to swell in the years ahead. Other performers that can tap into these powers will experience the same sort of exponential rise in fame. In other words, ladies and gentleman, the Biebers are coming. Viral marketing, self propagating news cycles, internet memes – these are all symptoms of the same phenomenon: accelerating media. Attention breeds more attention. The free exhange of information on the internet allows one person’s interest to spark another person’s interest with a speed and power that has never been seen before. There are the cute examples: millions of people watched an English boy bite his brother’s finger on YouTube. However, viral information exchange also played an important role in the 2008 US elections, the recent protests in Iran, and the ongoing ‘War on Terror’. 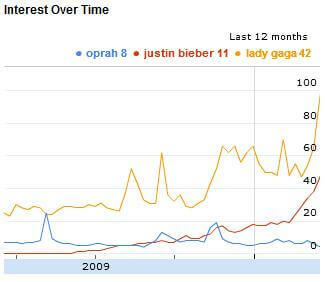 Here we compare Justin Bieber, Lady Gaga, and Oprah on Google Trends. Notice that Gaga has a much higher volume, but that Bieber is rising quickly, outpacing Oprah in just a few months time. The effect extends beyond the internet. 24 hour TV News channels fill their time by referencing their own work, getting experts to discuss the impact of the news they just reported – they amplify the importance of each news tidbit until it becomes a media frenzy (i.e. Balloon Boy). Radios play the same Top 40 music – reinforcing sales for albums that already have sold well. All these different systems interact with each other creating a feedback loop that allows a talented young Canadian to turn into an overnight sensation. Bieber, or his managers, are poised to make millions due to this feedback loop. Yet that’s a paltry sum compared to others who harness the forces of accelerating media. Online social network games have become a billion dollar industry. Farmville on Facebook gained more than 11 million players in less than two months. MafiaWars has had a similar rise on various social networks and there are many more games coming up. How is accelerating media responsible for the success of these games? 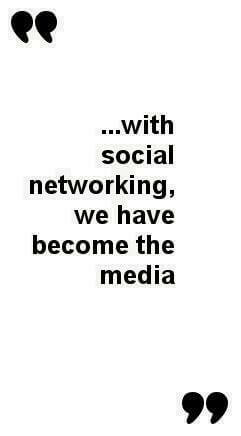 Well, with social networking, we have become the media. That’s right, part of the power of accelerating media arises as each and every connected individual becoming a micro-feed of news, opinions, and content. Instead of each nation having a few major TV channels and news networks, the world now has billions of individuals disseminating information. And they’re all connected, or they will be. Right now, language barriers still prevent populations from easily sharing their media in a meaningful way. That’s quickly changing, and universal translation tools will soon break down these last barriers and create a global network of interconnected users. In other words, the web that helps strengthen accelerating media is itself going to become more powerful in the upcoming years. Bieber is an example of how a Canadian singer quickly accelerated into becoming a pop sensation in English speaking parts of the world. Imagine what will happen when language barriers fall down and social networking becomes a greater part of our lives. The next Bieber could be singing in Portuguese in some small town outside of Rio or he could be making people laugh in Chinese in a bar in Beijing, or he could be moving hearts in a play for the deaf in Zaire. This new Bieber won’t have a following of millions, his fans will top out at over a billion. Somewhere the next Bieber is about to go from singing in his room to starring on MTV. Those little funny videos on YouTube aren’t so funny anymore. The same trends that make them popular are fueling billion dollar industries, making millionaire muscians overnight, and shaping politics everywhere. Mobile phones and the internet have amplified the world’s interconnectedness. New technologies like smart phones, brain computer interfaces, and augmented reality are going to increase it even further. So get ready for the consequences (and opportunities) of accelerating media. Anyone or any idea could blow up into a global phenomenon. This process only takes months today, it could take just minutes in the future. Positive feedback loops and the viral spread of attention are the defining forces of Media 2.0. Those who want proof need look no further than this.